To describe the prevalence of HIV-1 drug resistance mutations at the time of treatment initiation in a large cohort of HIV-infected children previously exposed to single dose nevirapine (sdNVP) for prevention of transmission. Drug resistance mutations were measured pre-treatment in 255 infants and young children under 2 years of age in South Africa exposed to sdNVP and initiating ritonavir-boosted lopinavir-based therapy. Those who achieved viral suppression were randomized to either continue the primary regimen or to switch to a nevirapine-based regimen. Pre-treatment samples were tested using population sequencing and real time allele-specific PCR (AS-PCR) to detect Y181C and K103N minority variants. Those with confirmed viremia >1000 copies/ml by 52 weeks post-randomization in the switch group were defined as having viral failure. 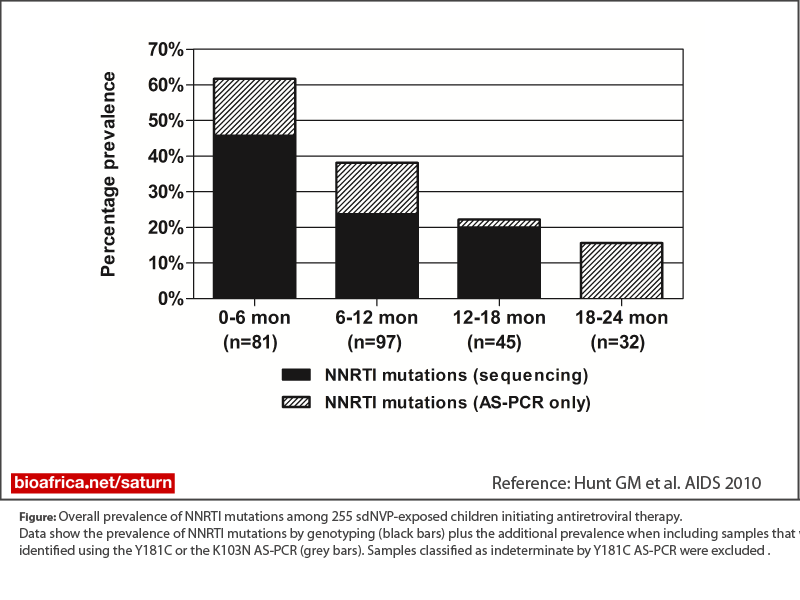 Non-nucleoside reverse transcriptase inhibitor (NNRTI) mutations, predominantly Y181C, were detected by either method in 62% of infants less than 6 months of age, in 39% of children 6-12 months of age, 22% 12-18 months, and 16% 18-24 months (p=<0.0001). NNRTI mutations detected by genotyping, but not K103N or Y181C mutations detected only by AS-PCR, were associated with viral failure in the switch group.